United Way has partnered with country music superstar Dolly Parton and her Imagination Library (DPIL) in an effort to increase childhood literacy. DPIL provides a FREE, new, and age-appropriate book every month for the first five years of life for all children living in Clinton County. This partnership provides support for children and families in language and pre-literacy skills as a cornerstone to building success in school, work and life. United Way’s long-term goal is to cut the nation’s high school dropout rate by 50%. Research shows that children who begin their school years behind their peers in pre-literacy skills, rarely catch up. The same children struggle to read through grade school and frequently get suspended during middle school – As a result, most drop out of school before graduating. As part of United Way’s Born Learning Early Learning public engagement campaign, four of the books provided by Imagination Library include Born Learning reading extenders that teach parents how to go beyond the book to reinforce pre-reading skills. 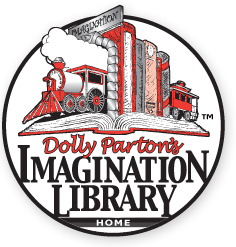 The Dolly Parton Imagination Library currently partners with 140 United Ways, with an ambitious goal to serve one million more children across America within the next five years. Currently the Clinton County United Way provides more than 400 pre-school children with books from Dolly Parton's Imagination Library and our goal this year is to increase it by more than half. Partnership Announcement Detroit, MI - Friday, May 15, 2009. Country music superstar Dolly Parton & United Way President CEO Brian Gallagher announce partnership between United Way and the Dolly Parton Imagination Library. To help support United Way's Efforts in providing Clinton County pre-school aged children with FREE books from Dolly Parton's Imagination Library your donation of just $30 provides one child 12 books per year. United Way never charges families for the Imagination Library books they receive -- all books are sent out to all families who sign-up absolutetly FREE. This service is possible because of generous donors. Your Child must be under the age of 5 and and live in Clinton County Pennsylvania to register.